Edward Moore “Teddy” Kennedy has been in the public eye all his life. 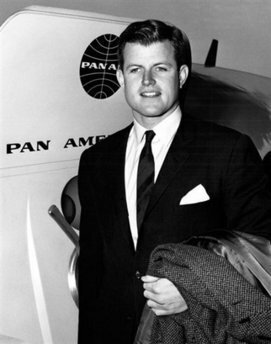 A child of privilege, Ted Kennedy and his siblings were brought up to believe that the highest calling was to serve the public. Serving 46 years, the nine-time senior Mass. Senator has also shouldered the patriarchal mantle of America’s most famous family for almost four decades. Enduring countless personal tragedies and the burden of oversized family expectations, Kennedy has forged a political career that is unparalleled in American history. Teddy: In His Own Words tells the story of Camelot’s last male survivor through his own words, from his childhood through his speech at the 2008 Democratic National Convention. Teddy: In His Own Words deftly combines the Senator’s own voice – culled from past commentary, speeches and public and private sources – with archival newsreel and television footage, iconic photographs and rarely seen archival footage, such as home movies and photographs, to tell the sweeping saga of Teddy Kennedy. What emerges is a portrait of a crusader who has kept his eye on the most important public goals, from civil rights and desegregation to minimum wage and health reform, despite a series of personal tragedies and crises. As the film shows, none of these setbacks derailed his career, and the rejuvenating bonds he shares with members of his illustrious family continue to this day. Three-time Emmy® winner Peter Kunhardt (whose previous HBO credits include the documentaries “JFK: In His Own Words” and “Bobby Kennedy: In His Own Words”), produces an illuminating and highly personal profile of one of the most influential forces in modern American politics. Through the years, Teddy’s reputation as a liberal icon fighting for the rights of the underprivileged has been balanced by his ascension to family patriarch, where he has brought counsel, wisdom and love to a new generation of civic- minded Kennedys. His recent battle with brain cancer underscores the fighting spirit and resiliency of this remarkable man, who continues his crusade for liberal causes despite daunting odds and advancing age. Teddy: In His Own Words is produced by Peter Kunhardt and Sheila Nevins; senior editor, Phillip Schopper; editor, Jennifer McGarrity; original music, Michael Bacon; co-producer, Caroline Waterlow. For HBO: supervising producer, Jacqueline Glover. For Kunhardt McGee Productions: executive producer, Dyllan McGee.